Flea Market, anyone? You know you are drawn to modern furniture and interiors, and yet you don't like a space that feels cold and sterile. And who could blame you? That's why Vintage Modern is so appealing to you. Though the backdrop of the room, the walls and windows, are many times white or monochromatic, the furniture and accessories have the color, shape and texture to bring the warmth into the space. The great thing about Vintage Modern is ease of mixing different styles in the one space. You can have a new modular sofa mixed with a great pair of chairs that your grandmother purchased in the late 1950's. The new and old work appear as though they were destined for each other. Even if you don't have time for swap meets and garage sales, so many of the mid-century pieces were so great that they have been remade and mimicked year after year. I mean, I couldn't have explained it better myself. I love mid-century modern furniture. However, I really want the feeling of my home to be cozy and warm. I HATE that "cold, sterile" feeling that a lot of modern homes give off. I mean, how is a baby supposed to romp around on cold, slate floors? I prefer my warm shag carpet please. 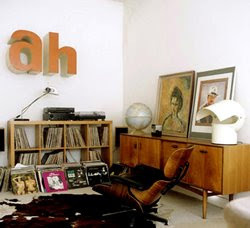 And, I DO like the feeling of old with new- mixing vintage-y type things with modern furniture- LOVE IT! I was extremely skeptical while taking the quiz because probably 75% of the rooms I either labeled "hate it" or "don't like". I think there may have only been one room that I "loved". I still don't understand how it was able to pinpoint me so well!! Anyway, I am glad I gave in and took this quiz. Now, I want people to ask me to put a label on my decorating style, "oh, vintage modern" I will say. ps. I would just like to say I took this quiz again because I was reading on the Young House blog how when they took it again they got different rooms and different results. This time I got 100% vintage modern! So, there is no doubt about it- this is my decorating style!